Operator/Mechanic Jobs. 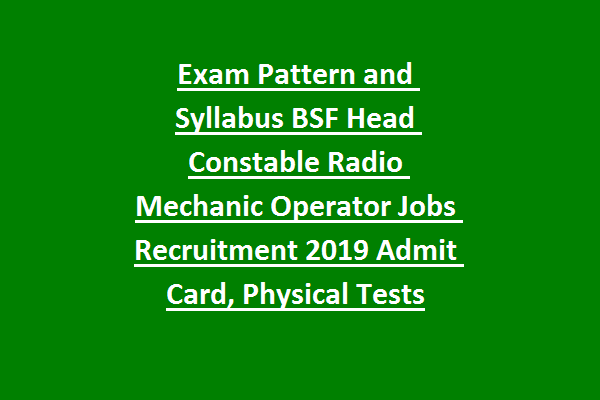 BSF Head Constable Radio Mechanic Exam Pattern and Syllabus, BSF Head Constable Radio Operator Exam Pattern and Syllabus, HC RO/RM Exam Admit Card/Hall Ticket, BSF Head Constable RO/RM Physical Standards Tests, BSF HC Radio Mechanic/Operator Physical Fitness Tests details are updated below for this BSF Head Constable Radio Mechanic Recruitment 2019. 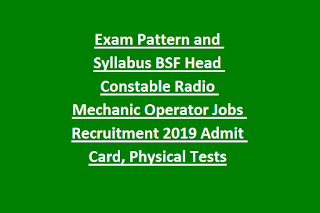 Online application for this BSF Head Constable Radio Operator/Mechanical jobs will be available from 14-05-2019 to 12-06-2019. Preliminary Exam date, PST/PFT details and other information for this BSF Head Constable Recruitment 2019 is updated below. Candidates selection will be written exam, physical tests, descriptive type test and medical tests. Written exam will be conducted in the form OMR based for this BSF Head Constable radio Operator jobs. Total 100 questions will be given and each question carries 2 marks. For each wrong answer 0.50 marks will be deducted. OMR based on exam consists of 4 parts. Exam Syllabus for Physics, Maths and Chemistry subjects is inter syllabus only. For English and GK exam syllabus is General Awareness, Current affairs, history and Geography subjects. Height is 168 cms and chest is 80+5 cms. Chest for adiwasis is 76+5 cms. Admit Card for this BSF HC RM/RO posts will be released 10 days before the exam date. Candidates must have check all the details in Admit Card. Without admit card candidates will be not allowed to written exam or physical tests. Along with admit card candidates must have produce the original ID proof to attend the exam. Admit card available link is http://bsf.nic.in/en/recruitment.html.